Midstream stocks and MLPs were up every day this week and finished with their best week since April 2016. For the MLP Index it was the 8th best week all-time, and it only took them 4 trading days to do it. 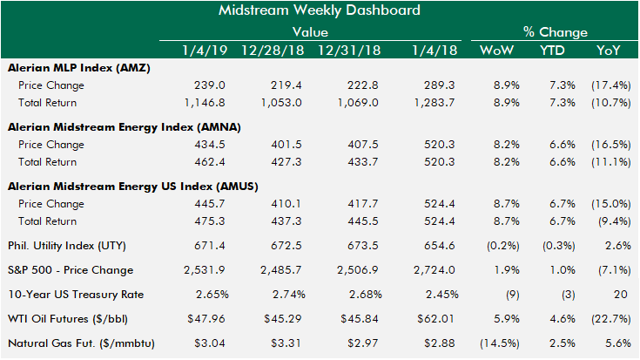 Midstream outperformed the S&P 500 and energy stocks by a wide margin. Midstream stocks and MLPs were up every day this week and finished with their best week since April 2016. For the MLP Index it was the 8th best week all-time, and it only took them 4 trading days to do it. Midstream outperformed the S&P 500 and energy stocks by a wide margin. Last weekend's Mariner East 2 news and this week's Capline reversal news were positive announcements, but it feels like this week's bounce was more about the calendar rolling over to a fresh year that seemed like it would never come. Kids can be a real hassle when they bicker and compete with each other. This week, one of my kids decided to stop competing with siblings and to encourage them instead; he also began to help out without complaining and with a smile on his face. 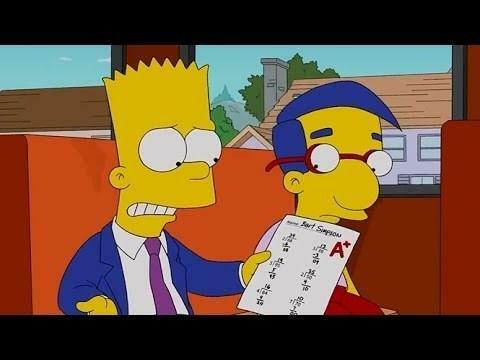 It was confusing, like the episode of the Simpson when Bart became a good boy. I was not used to this behavior and I'm not sure how long it will last, but I enjoyed it this week! That sums up the feeling this week watching midstream float higher. Enjoy the ride but be ready for regression if this newfound positivity doesn't last (again). But taking the other side, if that positivity we've all held on for does continue, let's consider the upper bounds of what's possible in 2019. It was the 5th year in a row MLP Index finished day 1 positive. But 2019's opening day was notable, because it was the biggest since 2013 and the 3rd best ever. Also, that strength came when the broader market was sharply lower. It wasn't just the first day. 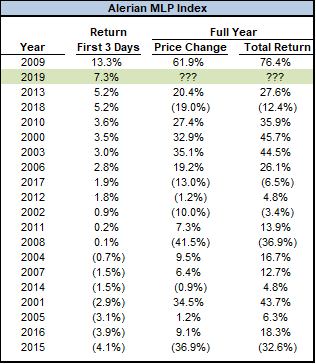 The first 3 days of this year have seen 7.3% gains in the MLP Index, good for the second-best start to a year ever, behind 2009, which turned out to be the best return year in the history of the MLP Index. In 2009, MLPs similarly jumped out to a massive lead over the S&P 500, beating the S&P 500 by 985 bps in performance the first 3 days of the year. This year, the AMZ is ahead by 630 bps after 3 days. It would be wild to see the MLP Index gain upwards of 50% in 2019, but a 50% price change in the MLP Index in 2019 wouldn't even get the index back to its January 2017 high, which itself would still be 63% away from the all-time high set in August 2014. The last week spanned a holiday and the end of the year, but Friday over Friday, there were some dramatic moves, most notably NBLX. 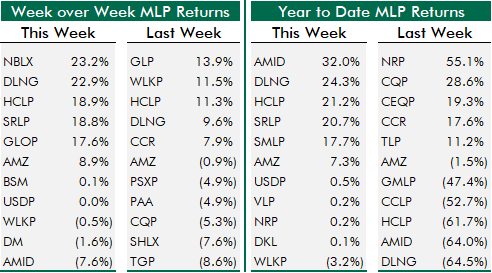 Only 3 MLPs were negative this week, including AMID, which is somehow leading the YTD leaderboard despite being the biggest loser week over week. Amazing volatility of late. HCLP and DLNG made it two straight weeks in the top 5, interesting because they were among the biggest losers for 2018. For the 2019 leaderboard, AMID is ahead after a wild week that saw a 30% decline Monday and a positive 27% move on Friday after a revised buy-out offer Thursday. 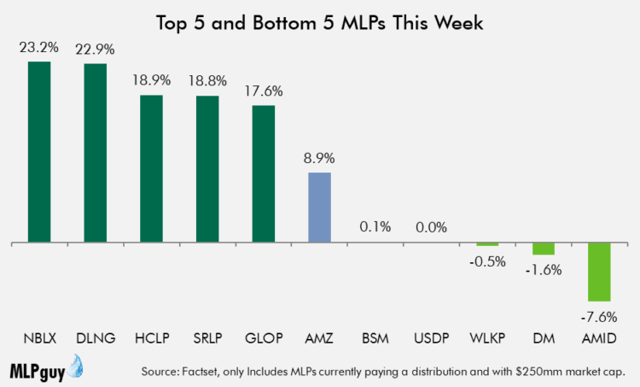 SMLP is among the early leaders after 3 days in 2019. In the midstream corporation and general partner group, there were no negative stocks. The top 3 performers were the biggest three losers of 2018 in this group. PAGP was the only one in the group with news this week, trading up sharply on the Capline reversal news. AMGP stands to benefit from the in-service of Mariner East 2, which may have led to some relief after a total collapse in AMGP's share price in December. TGE paused after outperforming the last few weeks. 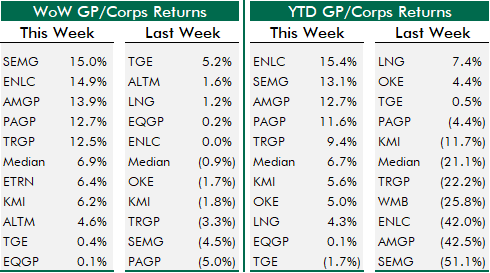 KMI was among the worst performers in the group again this week. 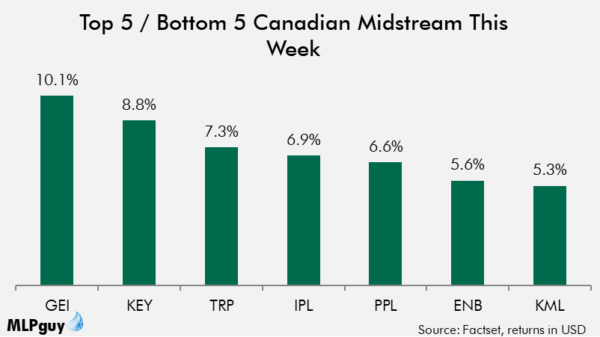 Canadian midstream traded in-line with U.S. midstream corporations, both of which slightly underperformed MLPs this week. Gibson posted double-digit gains, Keyera was strong and others were all tightly bunched in the 5-7% return range. 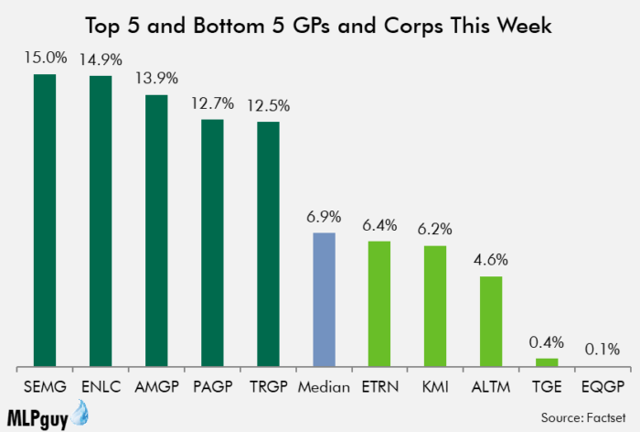 TRP took the early YTD lead in a very tight race to start 2019. Offer implies a 43% premium to prior day close of $3.15 but a 26% discount to the prior offer of $6.10/unit on September 28.